The AC2000 RTC (Real Time Computer) is a software controller required for use with Ethernet based CEM readers and devices as part of the core AC2000 access control system and the AC2000 Airport access control system. At the heart of the AC2000 system is the Central Database Computer (CDC Server), which is based on a client-server system architecture design. The AC2000 CDC server serves each of the connected client workstations and processes and stores all the alarms and transactions that occur on the system. The RTC software provides Ethernet reader controller software which is used by CEM readers and devices to communicate with the CDC. It has its own subset of the CDC server database which it uses to communicate to the readers. 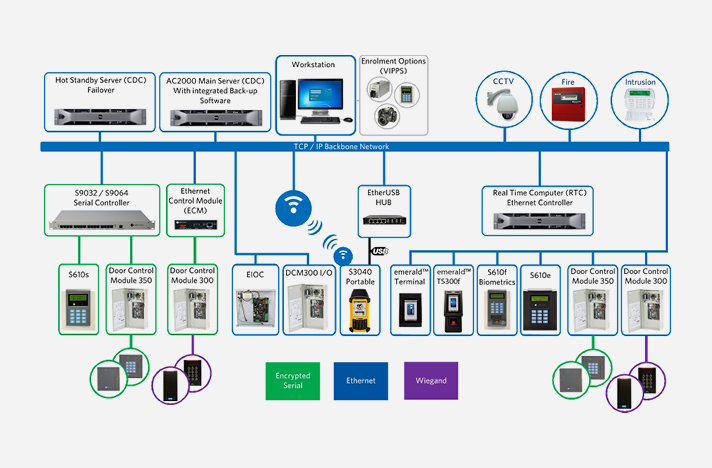 The RTC is used with CEM Ethernet devices such as the emerald touch screen reader, S610e reader, S610f reader, S3040 portable reader, eDCM 300 / 350 / 380 Door Controller Module range, eDCM 300 Input/Output Module and the EIOC (Ethernet Input/Output Controller). The RTC software can be installed on the CDC server, however when used in systems with over 256 master readers/devices, the RTC software is installed on separate PC hardware to handle system capacity.